The main feature of this type of trip is that there is no motor boat support. 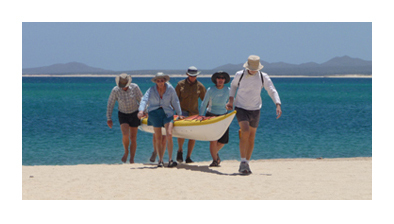 Therefore, you are kayaking fully loaded kayaks and participating in all the camping and cooking duties, under the leadership of your guides. On the 9 day Espiritu Santo circumnavigation trip, we make a mid week re-provision effectively halving the supplies we need to carry. It also enables us to take away your accumulated trash and take you out by motor boat to the sea lion colony to snorkel with the sea lion pups. We find this expeditionary style of trip enhances the feeling of comradeship and creates a greater sense of adventure and self-sufficiency.